UAE is India's third largest trading partner after the United States and China is nearly $60 billion and it is our second largest export destination. Great news!! Such type of agreements makes our nation more secure and gives a new move to leading progress. Prime Minister Modi has tried to instill confidence in their minds about the vast opportunity of investing in India. PM Modi will soon join all the famous personalities because his waxwork will make by Madame Tussauds. The British waxworks museum said that PM Modi is “one of the most influential statesmen on the world stage,” and he will attract the people of the areas London, Singapore, Hong Kong and Bangkok where he visited on April. According to Tussauds Modi is also involved in the creation of his waxwork and he offers the the museum’s artists a tea party in his new Delhi residence. Great news congratulations to Mr. Modi for this achievement. 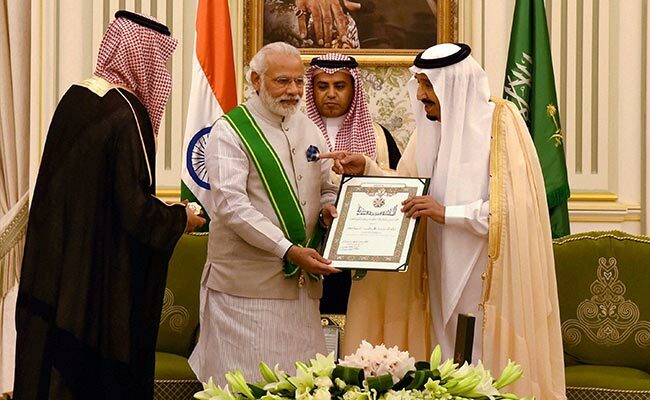 Prime Minister Narendra Modi was awarded with Saudi Arabia's highest civilian honour, by the King Abdulaziz Sash on Sunday, the second and final day of his visit to the Gulf kingdom. The others that got this honour are US President Barack Obama, British Prime Minister David Cameron, Russian President Vladimir Putin, Japanese Prime Minister Shinzo Abe and Indonesian President Joko Widodo.